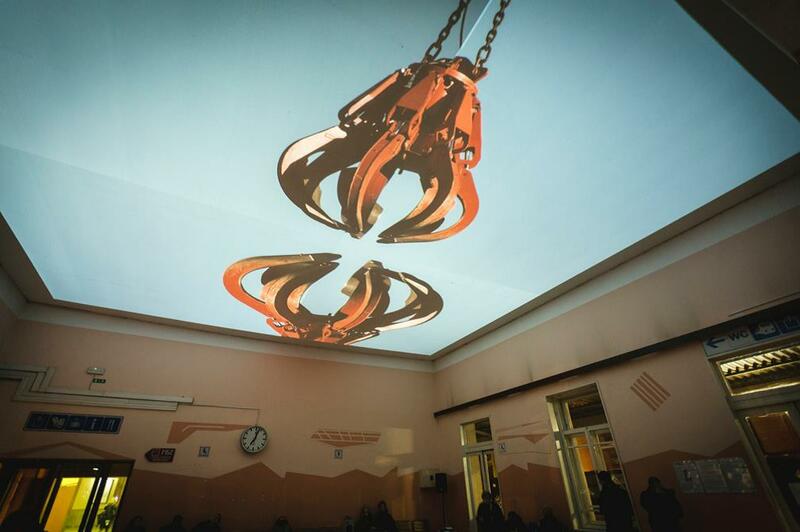 The installation has been displayed in the railway station in Rijeka, Croatia, where port, railway, and ship-building industry has been undergoing a slow and difficult process of loss and transition over the past 20 years. Still without a clear itinerary of where the industry is going and how it will arrive there, Rijeka is considering its possible futures. Concurrent with the city’s plans for future, many of its citizens have lost and continue to lose their jobs at the remaining working factories. There hangs a question in the air, if the city will ever prosper again without its industries. The story of the industry and thus the installation can be interpreted as a powerful metaphor for the narrative of Croatia itself, which has seen great success, crushing failure, and drastic change over time. The project is ultimately about different kinds of waiting: for a train, for a future. Toni Meštrović (Split, 1973) and Nadija Mustapić (Rijeka, 1976) are Croatian audiovisual artists. They also work as educators at the universities of Split and Rijeka. The artist couple documents social phenomena in their video and sound installations. They believe that art activates social progress, life and ideas. In their artworks documentary meets poetry and experiences of space. Mustapić and Meštrović are currently staying in the Saari Residence, maintained by Kone Foundation.